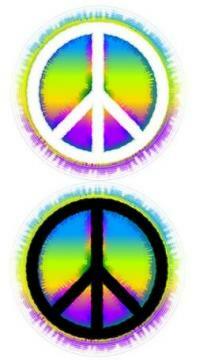 Peace sign tattoos are some of the most popular designs around. Their message is evident, their appeal is broad and they can go just about anywhere on the body. So, anyone who wants a tattoo can get a peace sign. Peace signs speak for themselves as a symbol for peace, of course. They've been the widely accepted symbol for peace for decades, stemming from an anti-nuclear symbol that was designed in Britain during 1958, according to Teach Peace. Before stemming out to the rest of the world as a simple way to convey a huge message, it was tied closely with certain protests and movements soon after 1958. 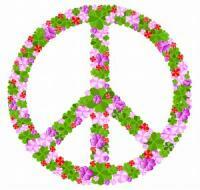 For a full history of the peace sign, visit Docs Populi's Peace Symbol Article. Characters - You choose the cartoon character, alien, celestial, etc. 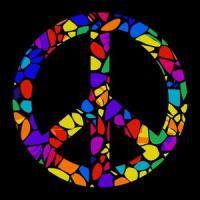 you like most holding up two fingers as if to say "peace" rather than the symbol itself. Non-traditional peace sign shapes, such as a star, triangle, etc. Rate My Ink doesn't disappoint in this category. This site allows users to view and rate others' tattoos. It's a great place to see how the finished product can look. Deviant Art has incredibly creative placement and designs, so don't forget to look there. It may not be the first resource you think of when you begin wracking your brain for new tattoo ideas, but you will be delighted when you visit. 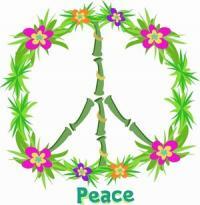 Tattoos Gallery is another site with plenty of peace sign designs to sort through. If you've looked online but you're still searching for the perfect tattoo of a peace sign, chat with your tattoo artist. He or she should be able to help you come up with something that works with what you have in mind. In addition, if you have several tattoos that have been done by the same artist, he already has a sense of your style and will be able to quickly design what you're looking for. Foot - Top or bottom, although beware of the maintenance involved. Wondering which well known celebrities have peace signs on their skin? According to Vanishing Tattoo, Singer Ashlee Simpson has one on her right middle finger and actor/musician Corey Feldman also has a bleeding peace sign on his left shoulder. If you'd like to add a peace sign to your skin, your options are endless when it comes to design, colors and placement.